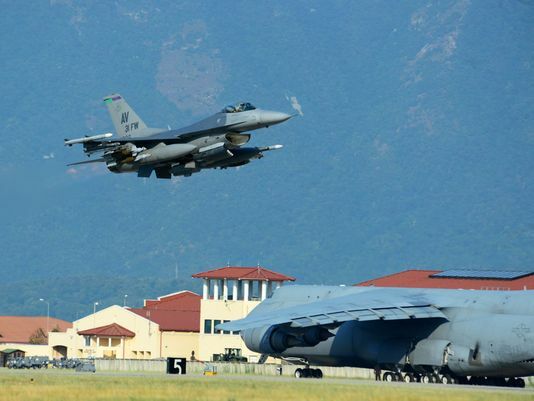 Five F-16 Fighting Falcons and nearly 300 Air Force personnel deployed to Turkey for campaign against Islamic State. The U.S. deployed six F-16s and roughly 300 airmen from the 31st Fighter Wing to Incirlik Air Base, Turkey, to support operations against the Islamic State. The small detachment of F-16s arrived at Incirlik on Sunday from Aviano Air Base, Italy, according to a post on U.S. European Command’s Facebook page. Turkey recently agreed to allow the U.S. to use Turkish air bases to launch airstrikes against the Islamic State. Those bases are much closer to parts of Syria controlled by the Islamic State than U.S. air bases in the region. The U.S. launched its first airstrike from Incirlik against the Islamic State on Aug. 4, when an unmanned U.S. aircraft attacked a target in Syria. The F-16s from the 31st Fighter Wing will be the first manned aircraft to attack the Islamic State from a Turkish base. Since Operation Inherent Resolve began on Aug. 8, 2014, the U.S. has dropped more than 5,600 bombs. The Air Force has flown 67 percent of the more than 45,259 total stories over the past year, averaging about 15 strikes a day. But Army Gen. Martin Dempsey, chairman of the Joint Chiefs of Staff, recently told lawmakers that planes are often coming back from missions over Iraq without dropping their ordnance. The U.S. strategy has so far relied on the Iraqi army, Kurdish forces and a small number of trained Sunni fighters to push the Islamic State out of Iraq. While the Iraqi forces and Shiite militias retook Tikrit earlier this year, the Iraqi military later abandoned Ramadi, the capital of Anbar province.